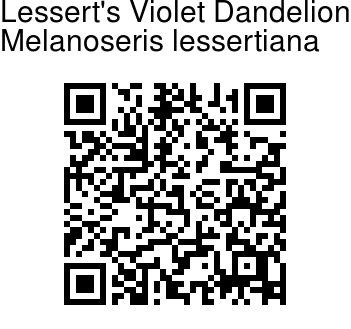 Lessert's Violet Dandelion is a herb named for Jules Paul Benjamin de Lessert, 19th century French banker and amateur botanist. 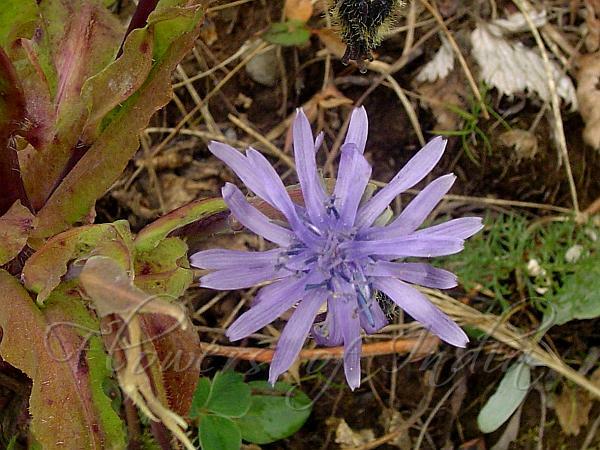 Flower-heads are blue or purple, sometimes drooping, borne on a stout, nearly leafless stem. Sometimes the stem is branched from the base with the flower-heads on the top. Flower-heads are about 1.5 cm across, involucral bract linear-oblong blunt, bristly. Stalks of flower-heads are sometimes blackish. often densely hairy. Leaves are inverted lanceshaped, entire or varyingly toothed or lobed, mostly 5-15 cm long. Rootstock is stout and the stem usually 3-20 cm long. Fruits are black, strongly ribbed, pappus white or yellowish. While fresh leaves are eaten after boiling, older leaves are parboiled. The leaves are very sour when young and are thus boiled to make them less sour. Identification credit: D.S.Rawat Photographed enroute to Dhel Pass, HP.